Nasogastric tube (NG tube): placed through one of your nostrils and travels down to the stomach. Nasoduodenal tube (ND tube) or nasojejunal tube (NJ tube): placed through one of your nostrils and pass into portions of the small intestine. Gastronomy tube (G-tube) or jejunostomy tube (J-tube): placed through a surgical incision in the skin into the stomach or intestine. Most enteral liquid food mixtures contain all necessary proteins, carbohydrates, fats, minerals, and vitamins so you can be sustained, even if you are eating minimally or not eating at all. Enteral nutrition can help protect or improve the absorption ability of the small intestine. 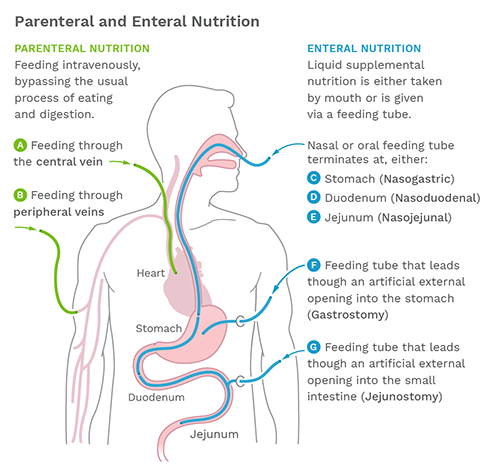 Partial Enteral Nutrition (PEN) is when you receive 30-50 percent of calories through formula and the remainder is from solid food or a regular diet. Exclusive Enteral Nutrition (EEN) is when you receive all of your calories through formula; you do not eat any regular food. This is a proven therapy to induce remission in pediatric Crohn’s disease. This type of nutrition is most popular in Western Europe, and has been most extensively used in children. Nutrition can also be delivered through a thin intravenous (IV) tube called a catheter, which is inserted directly into a large vein in the chest, arm, or neck. This is called parenteral (meaning “outside of the digestive system”) nutrition. Pareneral nutrition allows for nutrients to go directly into the bloodstream, instead of through the stomach or small intestine. Parenteral nutrition is used when the gut is not working (you are unable to absorb the nutrients you consume). This may also be needed for a short course when a flare is very severe; if you have a bowel perforation; or fistula, or if your nutrition needs to be improved before surgery. This could be needed long-term in Crohn’s disease if you’ve had multiple surgeries to remove portions of your small intestine and you develop short bowel syndrome. Please Note: All forms of nutritional support therapy should be closely followed by your healthcare team. Always discuss adding in any nutritional supplement with your team first.